So yesterday’s recipe was Chicken Enchiladas with Chili Verde Sauce and I served it with this rice. I figured it would be nice if I actually posted the recipe I was talking about huh? Ya, I am a little slow but I get there. I came up with this recipe as an answer to “What the heck am I going to serve with the enchiladas?” question. You see, as much as I adore Mexican food and just about everything that goes with it, I do not like Spanish/Mexican rice. Most of the times I have had it it seemed basically rice in tomato paste and a few spices. I am not knocking those of you that enjoy it. It just wasn’t doing it for me ya know? I wanted something with a bit more heat and some veggies too. So the little wheels in my head started grinding and I got to work. Don’t let the mention of heat run you off if you don’t like things very spicy. Jessi is not a fan of all things spicy like most of us here and she said it had just enough heat to it without making it hot so I was able to walk that fine line and keep everyone happy. YAY me!!! This was a perfect addition to our Mexican Fiesta. In a medium sauce pan, cook rice in oil over medium heat for about 3 minutes. Pour in chicken broth, and bring to a boil. 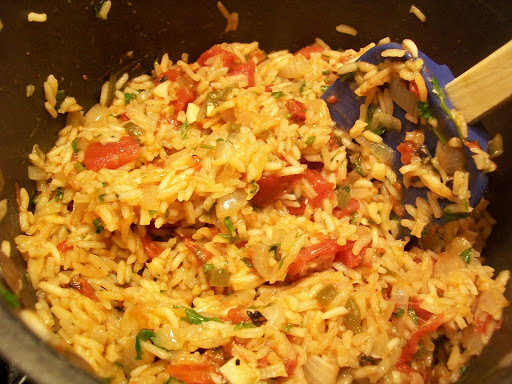 Stir in onion, garlic, jalapeno, and diced tomato. Season with salt, pepper, and cumin. Bring to a boil, cover, and reduce heat to low. Cook for 20 minutes. Fluff rice with a fork and stir in cilantro. Boy, when Rachael said made quick she really meant it! These “pies” are super easy and super quick to make. Again, not so many ingredients, so not a lot of slaving away to be done over the meal. I did add some minced garlic to the recipe, as per Jessi’s request. I don’t think there is much we cook with out onions and garlic in it! The meat smelled great after cooking with the onions and garlic and then you add the brown sugar, tomato paste mixture and it went from great to YUM. I love it when the food smells so good you want to just eat it out of the pot! I do suggest that when you bake the pastry dough sheets that you do it on parchment paper or a very good nonstick cookie sheet. I had a bit of a “stickage” issue with mine. I think this would be great if you added some spice to the ketchup on top too. I mean if you don’t like things spicy by all means the regular ketchup is great. But for those that like it a bit hot I would add some of your favorite hot sauce to it. I use Frank’s Red Hot a lot or Sriracha hot sauce (you can find it in the Asian isle at your market). Last impressions on the recipe are that it tastes great, it is easy to make, and my kids gave it two thumbs up, oh so did Kevin too! I will say I think this makes a great lunch recipe more so than a dinner one though. But either way, bring your appetite! With a sharp knife, cut the thawed but chilled puff pastry sheets into 4 square, 8 squares total, and arrange on cookie sheet. Season the squares with a little salt and pepper. Bake the puff pastry according to the package directions or until golden brown all over, about 12 to 15 minutes. Heat a medium skillet over medium-high heat. Let it get really hot so the meat will caramelize when it hits the pan. Add the EVOO, then the butter. When the butter melts into the oil, add the beef and really work at breaking it up as it browns-get the bits all nice and tiny. Add the onions and cook for 5 minutes. Stir in the flour. Cook mixture a minute more. In a small bowl combine the Worcestershire sauce with the tomato paste and brown sugar, then whisk in the stock. Whisk the seasoned stock into the pan. Stir into the meat and combine. Season the meat with grill seasoning and reduce the heat to low. When the pastry squares are ready, assemble the pies. Place a square of pastry in the bottom of a shallow bowl. Top with one quarter of the meat mixture and another square. Place a large dollop of ketchup in the center of the top pastry and sprinkle the “pies” with chives to garnish, then serve. By now you know that I am a Mexican food fanatic. It can be a bit of an obsession really. Since I live in a very small town in Western Washington my choices in restaurants that serve Mexican food are slim to none, especially if you want it to be good Mexican food. When Jessi and I were in Tacoma last year looking for Halloween costumes, we came across a tiny little Mexican market that also served food. We just about got whiplash because I turned the car into the driveway so quickly! We were both so excited to find a new place to try out. Well, it turns out that we shouldn’t have been so excited. But Jessi was happy because she was able to get some Mexican soda and candies she hadn’t had since we moved from San Diego to Washington. Due to this lack of satisfaction with the choices I have been faced with, and my continued cravings, I am constantly trying to duplicate the wonderful foods of my past. As I have mentioned in past postings, Kevin doesn’t exactly share my enthusiasm for my obsession. He is not a fan of burrito’s, carne asada, tacos, etc. However one dish he does like is enchiladas in green sauce (chili verde). So you know I jumped on that right away. I had a way to calm my craving and make a meal that I knew Kevin would enjoy. I took a little help from premade salsa on this one. I do want to create my own chili verde but there were no tomatillos in the store so I went for the next best thing. 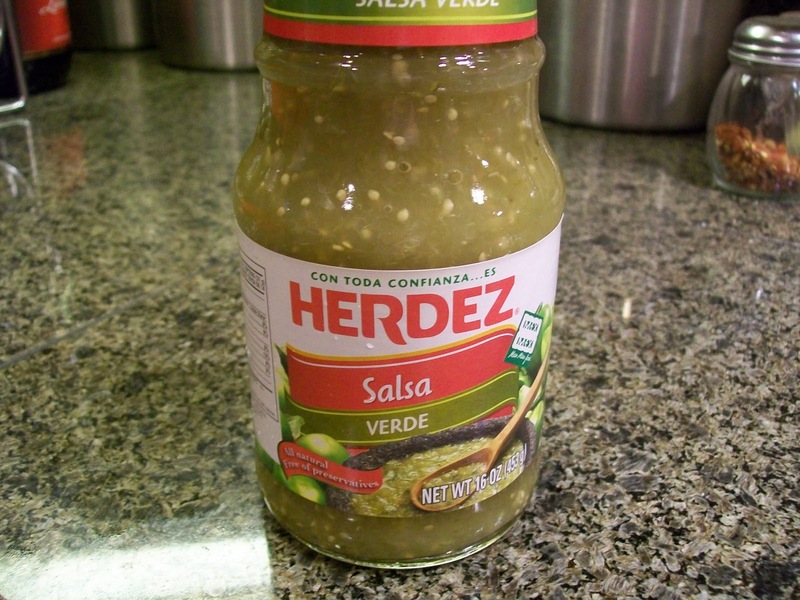 I will tell you that the best brand of salsa verde I have found is Herdez. If you can’t find this one there are other very good ones out there. I just have a little love affair with this brand. With traditional enchiladas you use corn tortillas and have to run them through hot oil to make them soft enough to roll without cracking. I have always done them this way (was taught by my son’s babysitter who was from Mexico) but hated that it added so much fat to the dish. Imagine my happiness when I found corn and wheat combo tortillas. They were bigger than a regular corn tortilla and soft like a flour tortilla, but still had that corn flavor I love. If you can’t find these combo tortillas I would just use the soft taco size flour tortillas to save the hassle and calories of the whole oil routine. I used 10 x 13 pans and that worked out to make 8 enchiladas. I also made a pan of plain cheese enchiladas for my Dad and Jessi. After you cut the chicken breasts into strips, drizzle them with olive oil and sprinkle them with the seasoning mixture. Once the chicken bakes for 15 minutes and cools, shred it with two forks. Saute your onions, garlic, and jalapeno over medium heat until the onions are translucent and the peppers ae soft, about 5 minutes. 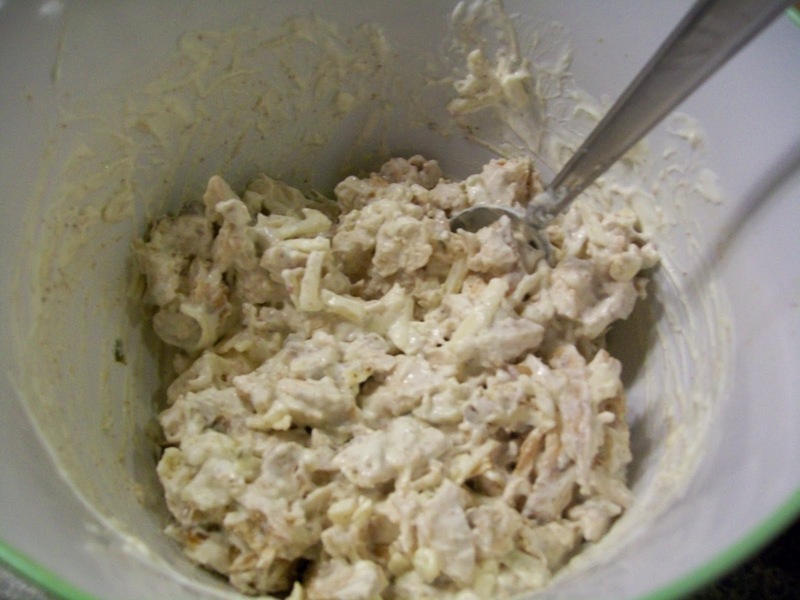 Mix the shredded chicken, sour cream, cheese, left over spice mixture, and onion mixture together in a medium bowl. Spoon 1/8th of the mixture into a tortilla and roll it up, placing it in a 10 x 13 pan. 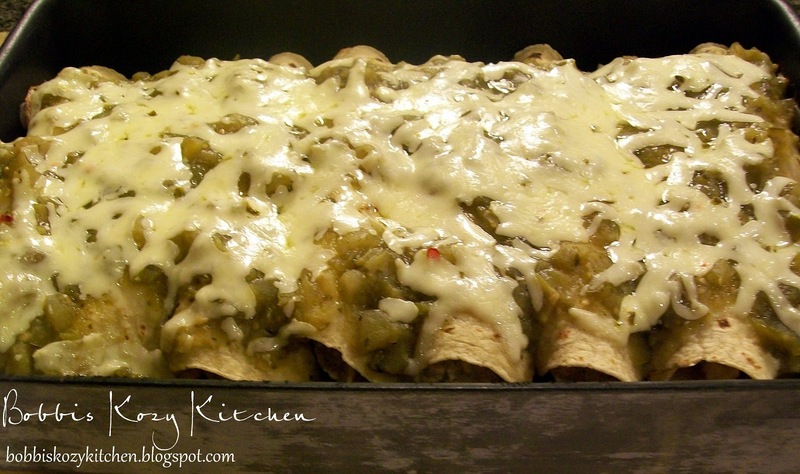 Top enchiladas with the salsa verde and sprinkle with left over cheese. Bake at 350 degrees F for 25 minutes. In a small bowl combine the cumin, chili powder, garlic powder, and salt. 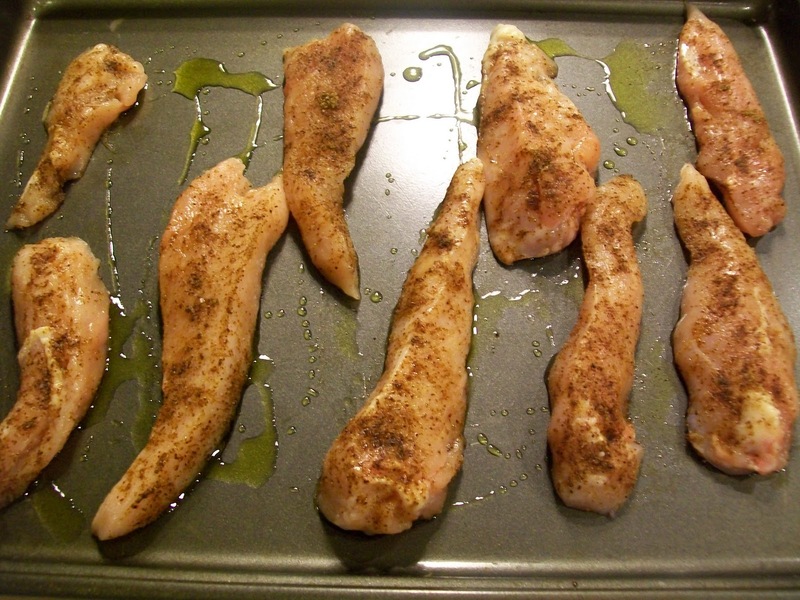 Place chicken strips on a rimmed baking sheet and drizzle with olive oil. Sprinkle with the chili powder mixture, reserving any unused mixture. Bake for 15 minutes and remove from oven, set aside to cool. Meanwhile in a medium skillet over medium heat, drizzle a tablespoon of olive oil. 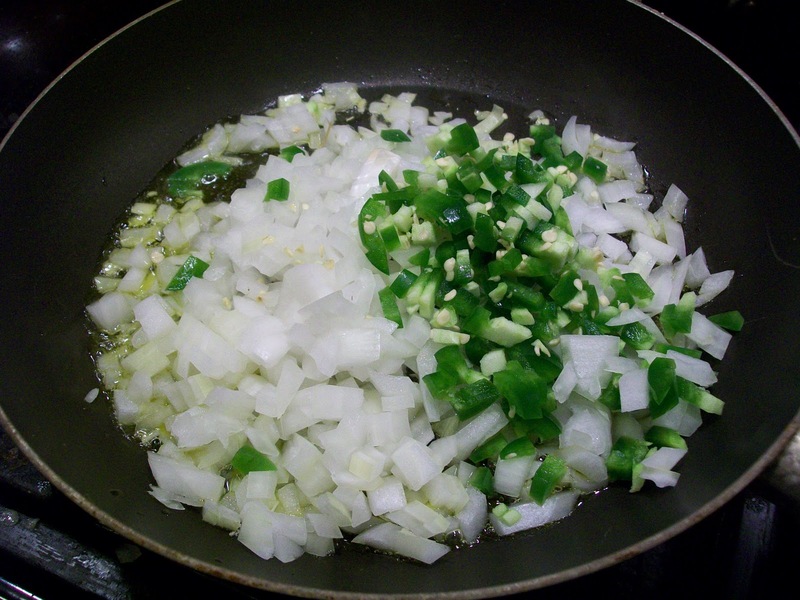 Add the onions, jalapenos, and garlic. Saute until the onions are translucent and the peppers have softened, about 5 minutes. Remove from heat. 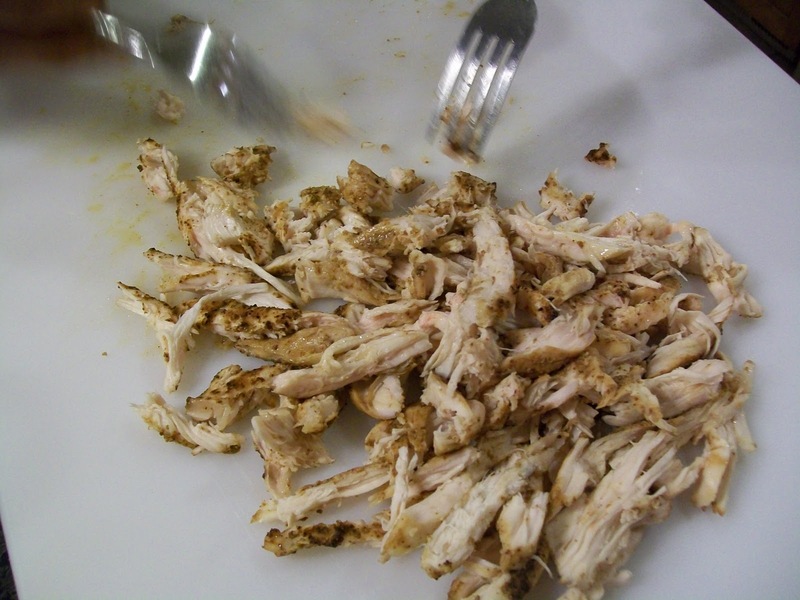 Shred the cooled chicken strips with two forks and place in a medium sized bowl. Add the onion mixture, sour cream, 2 cups of cheese, and the remaining spice mixture. Stir to combine well. Spoon 1/8th of the mixture into a tortilla and roll it up. Place the enchilada in a 10 x 13 pan and continue with the remaining 7 tortillas. 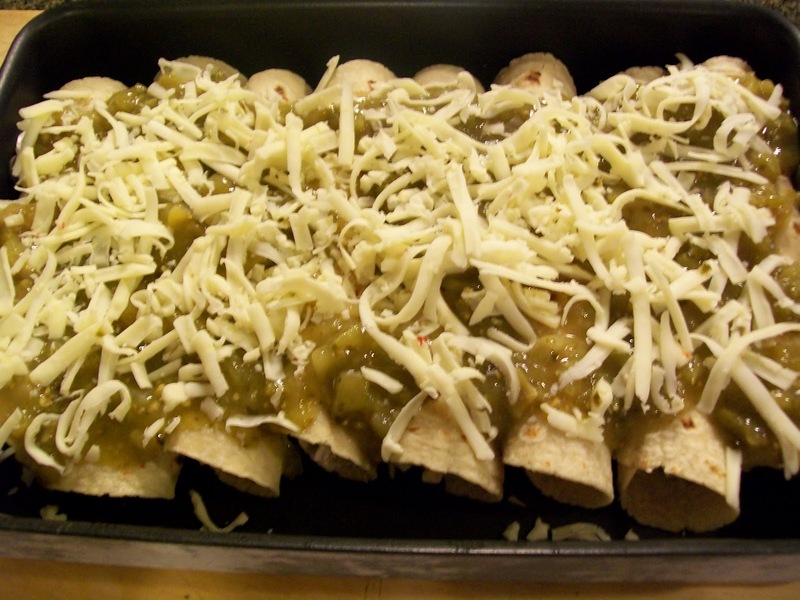 Pour the salsa verde over the top of the enchiladas and sprinkle with the remaining shredded cheese. Bake at 350 degrees F for 25 minutes. Remove from oven and serve with Salsa Rice. Yes folks it is time for another Rachael Ray Wednesday! YAY!!! The other day while I was getting some work done, I had Food Network playing in the background as usual. My son Seth came downstairs and sat next to me so we could chat a bit. It seemed like both of us at the same time looked up at the TV and saw the recipe that Rachael was making. Our mouths both began to drool. He looked at me and before he even got the words out of his mouth I said, “I have GOT to make that”! It was the show entitled “Sofa Night” and Rachael was making the yummiest looking sandwich I think I have ever seen her make! I immediately grabbed a piece of paper and began writing down the ingredients so I could go to the store. Both of us were so excited. Yes I have created Jr Foodies folks, my kids get just as excited about food as I do I think. My daughter is taking the culinary program at her school. Isn’t she adorable in her chef jacket? Seth – Ummm when is dinner going to be done? Me – UGH get out of my kitchen! The recipe calls for 2 loaves of ciabatta bread and 4 6 to 8 ounce steaks but I will tell you that I only used one 12 inch loaf and 1pound of steak and it was plenty for 3 people. I have no idea how 4 people would have eaten twice as much! These are very filling. The meat was tender, the cheese sauce was ooooooooh so creamy, and the peppers and onions were the perfect topper to make this seriously the BEST sandwich I have ever eaten. 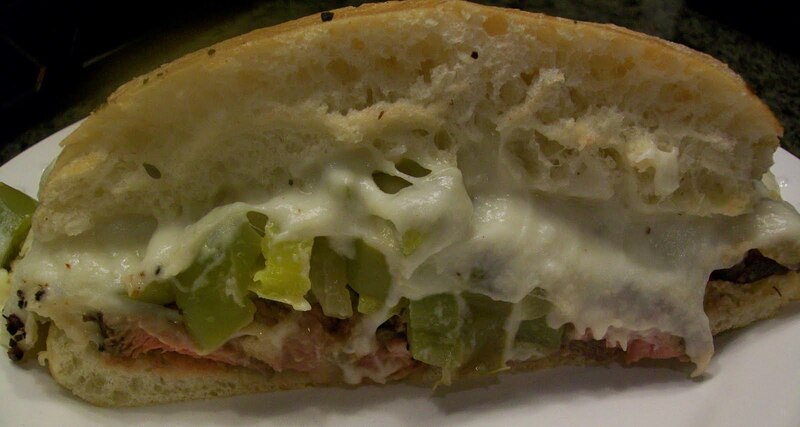 It is kind of a riff on a Philly Cheese Steak but with an Italian flair. Since we like things spicy here, the next time I make these I am going to add more of the hot pepper rings and juice and probably some crushed red pepper flakes too. The provolone cheese is nice and salty so I think it would hold up well to some extra heat. Leave the steaks on the counter, to take the chill off, while the grill or grill pan heats up to medium-high heat. Coat the steaks with EVOO and grill seasoning. Heat 2 tablespoons of EVOO in a skillet over medium-high heat. Add the cubanelle peppers, onions, and garlic and cook until very tender, 10 to 12 minutes. Add a splash of the hot pepper juice and the hot pepper rings, remove from heat. While the peppers cook put the steaks on the grill or grill pan, and cook for 10 minutes for rare, 2 minutes longer for each level of desired doneness, turning once about midway through cook time. Meanwhile heat a sauce pan over medium heat and add the butter. When the butter is melted whisk in the flour and cook for 1 minute. Whisk in the milk and season with salt, pepper, and nutmeg. Thicken the sauce for a couple of minutes and then reduce the heat to low. WHen the steaks are cooked to desired doneness, remove to a cutting board and let rest there for 5 minutes. Thinly slice on an angle against the grain. While the meat rests place the bread in the oven to warm and stir the cheese into the sauce. To serve split the bread lengthwise and spread the steak slices evenly across the bottom of the bread. Top the steak with the sauce and peppers and onions. Cover with bread tops and cut into 4 equal slices. I wasn’t able to sleep last night, and around 3:30 am, I decided that I wanted to make breakfast to surprise my family. So off to google I went, and about ten or so minutes later, I knew I had to make cinnamon rolls. It’s one of the things our household shares a love for, so what better way to start the day? There’s actually a pretty interesting story behind me making cinnamon rolls. I’ve only made them one other time, while my mom and I were living in Poway, CA. I was in my first semester of my sophomore year of high school, and I needed a “make-up” dish for my cooking class since I had missed a kitchen day. After hours of searching online, I decided to make cinnamon rolls. I read the recipe and thought it sounded like fun. It was one that you made from scratch with yeast and water. My mom was going to be at a friend’s house that weekend, so I figured I’d make them then since our apartment was tiny and I didn’t want her to stress out from seeing a messy kitchen (and if you’ve ever baked, you know that it can get ridiculous). Wrongoooo!! Not long after I put the rolls in the oven (and they looked absolutely perfect, I was so excited), the news anchor announced that Poway was to evacuate immediately. Many profanities ran through my head, and I quickly picked up the phone and called my friend to ask if her and her mother could come get me because I was alone. I packed a weekend bag, and just as I was headed out the door, the timer for the rolls went off. I took them out of the oven and was devastated because they looked amazing, but they were much too hot to take with me. I covered them in tin foil, heaved a sigh, and headed out the door. By the time they got the fire under control and my mom and I were able to safely return to our apartment, the rolls were stale…but we ate them anyway, and guess what? THEY WERE DELICIOUS!! 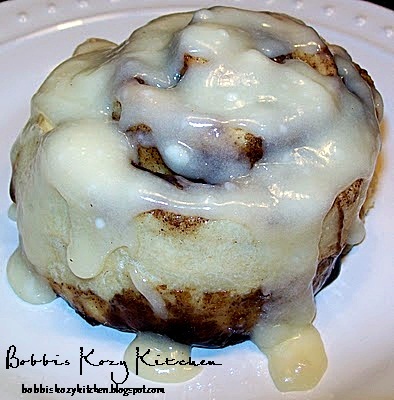 My mom told me then, and has told me several times since, that my rolls were better than Cinnabon, but for some reason, I never made them again. It took me a little while to find the perfect recipe, and when I did, it was one that you would make in a bread machine. However, I have no clue how to use a bread machine, and my mom was still asleep, so I decided to pull from my memory and make the dough without one. After I made them and let them cool down a little (5 minutes TOPS! You want these bad boys to be hot, just not hot enough to scorch your mouth! ), I took one in to my mom and upstairs to my brother, who had been up when I had the brilliant plan. Seth scarfed it down, taking a breath every now and then to say “Oh my God”, which was no surprise. Out of all of us, I think he’s the one who loves cinnamon rolls the most. My mom had still been sleeping, so she set it on her bedside table until she woke up a little more. When she got around to eating it, she loved it, making me a very happy little baker! 1. Dissolve the yeast in the warm milk in a large bowl. Mix in the sugar, margarine, salt, and eggs. Add the flour in quarters and mix well. It will get a little tough, but keep at it until it’s well mixed! If it starts to get way too hard to mix anymore, dust your hands with some flour and finish mixing it by hand. 2. Knead the dough into a large ball and put it back into the bowl. Cover it with a dish cloth and let it rise in a warm place for about an hour, or until doubled in size. 3. Preheat your oven to 400 degrees F (200 degrees C). 4. Roll dough into a large rectangle (Make sure not to roll it too thin, or it will rip when you roll it up). Spread dough with the softened butter and sprinkle the brown sugar and cinnamon mixture evenly over it. Roll the dough up and cut into 10 rolls, discarding the two end bits. This will leave you with 8 good sized rolls. 5. Place rolls in a lightly greased 9×13 inch baking pan. Cover and let rise until nearly doubled, about thirty minutes. 6. Bake rolls in preheated oven until golden brown, about 15 minutes. While rolls are baking, beat together the ingredients for the frosting. Spread or drizzle it on warm rolls before serving. For the last weekend of summer I really wanted to pull out all the stops and celebrate the wonderful weather we had finally been having in Western Washington. I planned grilling burgers and corn and chicken. I wanted to make some quick cool salads to beat the heat and accompany the grilled food. My absolute favorite salad green is baby spinach! It could be the only green I ever eat again and I would be happy. Not that I wouldn’t miss the others, it is just my favorite. Yikes now I am afraid to open my vegetable drawer in my kitchen. I may have offended a few things that are currently residing there. Anyway, I jumped online and started searching for a new recipe to showcase my lovely greens. I found this one by Rachael Ray (I know shocker right? Bobbi is doing Rachael Ray??). It has another of my favorite ingredients, artichokes. I prefer my artichokes fresh steamed, but I do love canned artichoke hearts on pizza so I figured “Let’s give it a try”. My decision was a good one. Kevin and I ate this salad up like it was candy! The kids…uuhhh not so much. But we already knew that would be the outcome. I tease them about someday having an adult pallet and appreciating something other than McDonald’s and frozen burritos. Actually I can’t complain that much. They have come a longggggggggg way in the last few years. 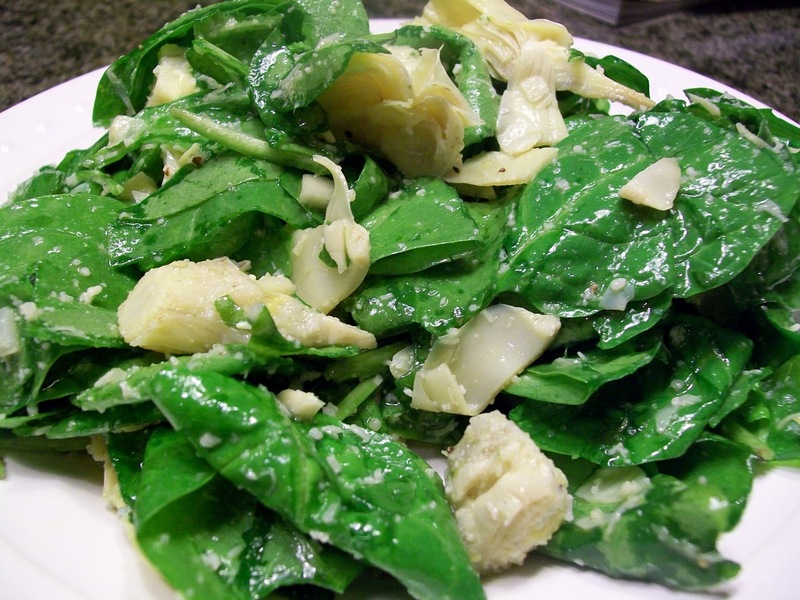 Combine spinach and artichokes. Place garlic, lemon zest and juice in small dish and add vinegar. Let it stand 5 minutes then whisk in extra-virgin olive oil. Pour oil and vinegar dressing over salad and toss to combine. Season the salad with salt and pepper, to your taste. Top the salad with cheese then serve. Ok so I know there probably a lot of people that are thinking “brauschweiger? eewwwww” right? I think brauschweiger is like the black jelly beans. Either you love it or HATE it. But if you have any questions in your mind, give this spread a try. This is a recipe that my Mom always made for parties. It is super easy. I mean 3 ingredients really. My Mom used to chill it after it was all combined and then roll it in a ball and cover it with dried parsley. That part I wasn’t so happy with, so I didn’t include that step. But it might be good rolled in fresh chopped parsley (I didn’t think about that until we had already dived in). I like this as a munchie food for football games. A few crackers and away you go. 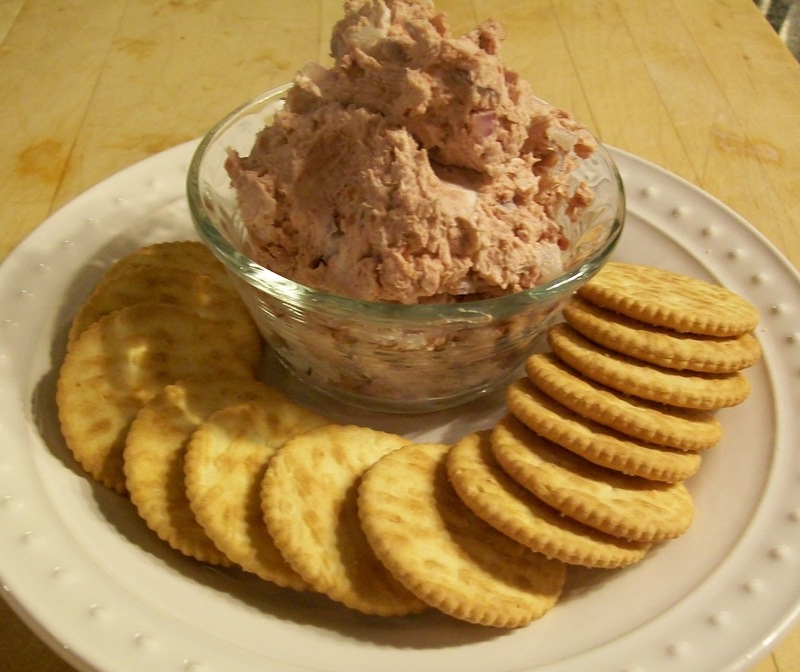 In a medium bowl combine braunschweiger, cream cheese, and onion. Stir to combine. Refrigerate for a hour before serving. I made this salad last week, but with Kevin’s son Dylan visiting from Job Corps and Jessi being on leave as well, I had a FULL house. Sadly my posting duties suffered. Kevin wasn’t feeling well on Wednesday and of course the mother in me came out full force. I mean I had a full house of kids so I just kind of lumped him into the group. I was asking all the “Mom” questions…..What did you eat today?…..Did you drink enough water…….Are you running a temperature, let me feel your forehead. He quietly put up with all of my poking and prodding and then turned to me straight faced and said very matter of factly, “I think it is because I need RED MEAT!”. I laughed, but realized I have been cooking a lot of chicken, I mean a LOT of chicken. Like I have said in the past, I could eat chicken and fish and leave red meat pretty much on the road side holding a side that says “Homeless, need a job”. Non the less, I felt guilty neglecting his needs, so off I went to the store to get a steak to calm his inner beast. We have a local meat market and I can tell you that once I found that I will never get steak at a chain grocery store again! Their meat it so much more flavorful it makes me actually want to eat steak (I am more of a filet girl if I eat read meat…..ya I am pricey). ( like this one for instance Rib Eye Steaks with Chimichurri and Chili Pilaf ). But given a choice he will tell you that he prefers a bit of salt and pepper and toss that meat on the grill! So I knew no fancy stuff for this meal, at least NOT for the meat. I began searching my pantry and came upon my jar of pickled beets, yesssssssss. I had mentioned this salad last weekend and then never got around to making it, so this was my perfect opportunity. I was so excited to find out Kevin likes beets. My kids turn their noses up at them so I really haven’t had beets since I was a kid, you know like 10 years ago or so hehehe. Now that I know he likes them I have visions of roasted beets playing in my head. Kevin’s son Dylan was not so sold on the whole beets thing. He was in the kitchen and I hear a voice..
Dylan – What’s in this bowl? Kevin – JUST EAT IT! Bless his heart! Ms Picky Pants wouldn’t even try it *sigh* I tried to explain that she was in culinary now and needed to broaden her horizons. Her response? That’s what a sous chef is for! Oy Vey!! This salad is so good I could eat it every day. All of the ingredients play together so nicely. If you like beets, you HAVE to give this one a try!! And make sure to check out the Purdy Pickle Company, they are the ones that gave me these fabulous pickled beets and recipe! In a small skillet over medium heat, toast the walnuts about 3 to 4 minutes. 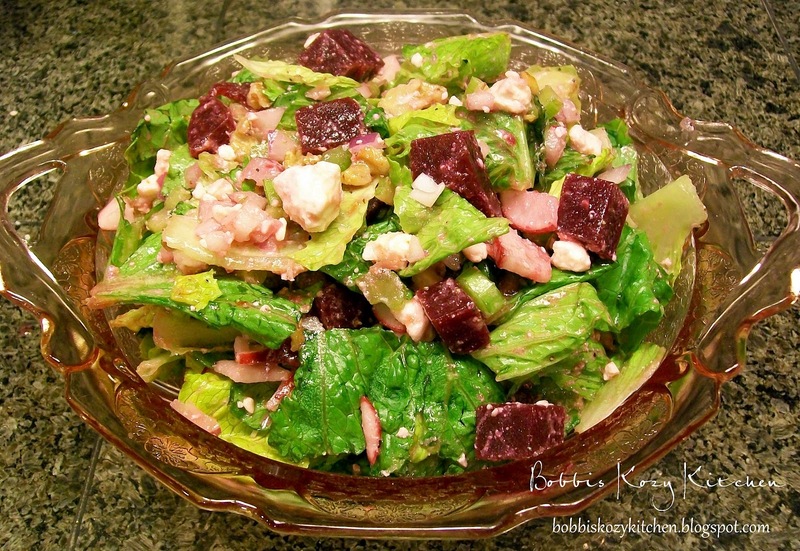 In a large bowl combine lettuce, onions, radishes, celery, and beets. In a small bowl whisk the raspberry preserves, vinegar, and oil. Dress the salad with the raspberry preserve vinaigrette. Top with feta cheese and walnuts, and toss. Although Mother Nature is giving us a reprieve from the rain and cooler weather today here in Western Washington (it is going to be 78 yessssss). The temp has definitely dropped enough to let us know Fall is on it’s way. I know I complained a bit about it, but that is just because we had maybe a month of Summer this year and I didn’t want to let go off it. However, with the drop in temperature, my love for Fall soups, stews, chowders, and chili is in high gear. I just have to balance them out so my family doesn’t get burned out on them. I think I seriously could eat them every night, but that is just me. This is a recipe by Giada De Laurentiis that I have made a few times in the past. I love it, it is tasty and very healthy, and the big plus is my FAMILY likes it. What? My family, the WHOLE family actually likes something and it turns out it is healthy? Ya, I know, I was shocked!! Usually I have one straggler that just can’t jump on board with the rest of us. But there really is nothing to dislike about this chili. In a large heavy bottomed saucepan or Dutch oven, heat the oil over medium-high heat. Add the onion and cook until translucent, about 5 minutes. Add the garlic and cook for 30 seconds. Add the ground chicken, 1 teaspoon salt, cumin, fennel seeds, oregano, and chili powder. Cook stirring frequently, until chicken is cooked through, about 8 minutes. Stir the flour into the chicken mixture. 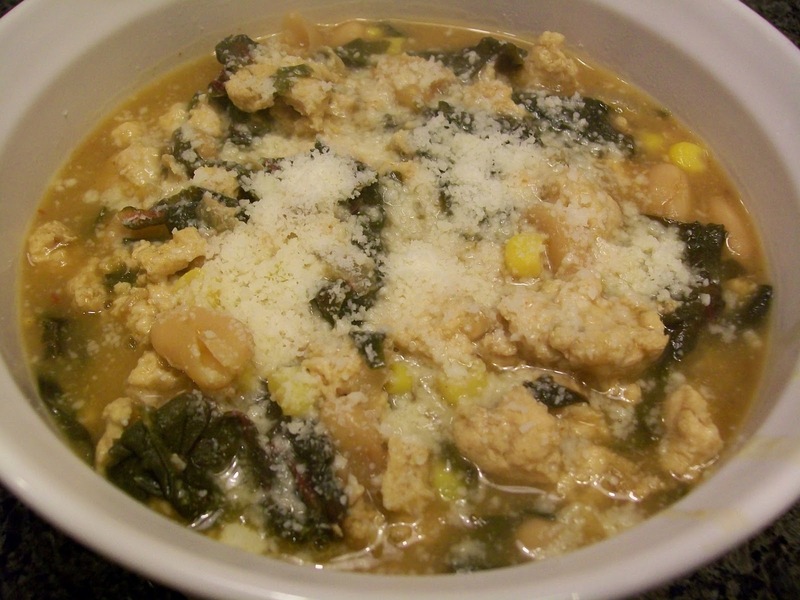 Add the beans, Swiss chard, corn, and chicken stock. Bring the mixture to a simmer, scrapping up the browned bits that cling to the bottom of the pan with a wooden spoon. Simmer for 55 to 60 minutes until the liquid has reduced by about half and the chili has thickened. Add the red pepper flakes and simmer for another 10 minutes. Season with salt and pepper to taste. Ladle the chili into serving bowls. Sprinkle with the Parmesan cheese and chopped parsley. I love the fact that this is one of the recipes I make that when my kids hear what I am making I hear a resounding YAY!!! 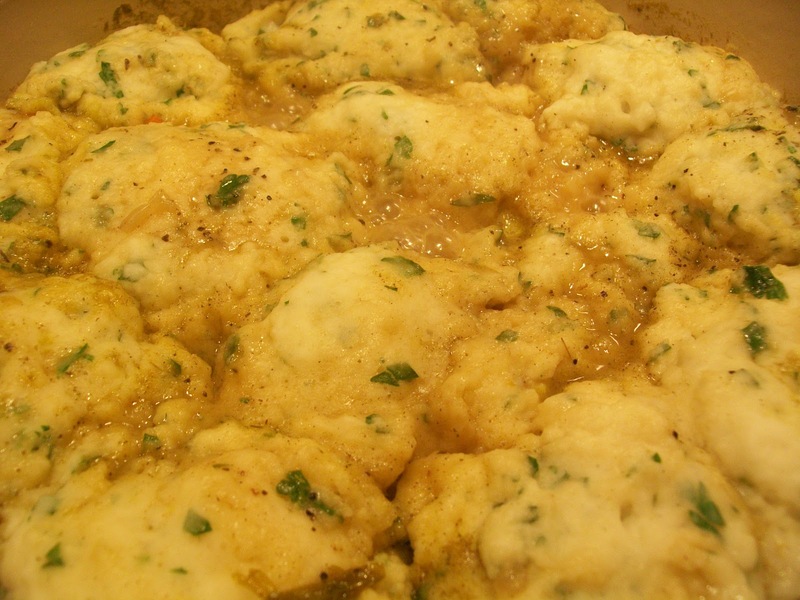 They refer to it as my “Famous” Chicken and Dumplings. Gotta say that makes me feel good. I have been chomping at the bit for Fall weather to arrive so I could make this meal! I think 2 months ago I bought all of the ingredients to make it and when Kevin asked what I was going to cook for dinner I told him. He looked at me like I had lost my mind (he gives me that look quite often, I think he is trying to tell me something). I knew that it was too hot to make it really but I just was craving it sooooo much. This is one of the fist recipes that I came up with and have the recipe in my head. It has become more “a little bit of this and ……. oh ya, some more of that……ok lets add this too vs a strict recipe. So you can imagine when I got down to the business of cooking I though “Hhhmmmm I had better pay attention to what I do so I can actually “write” a recipe. I was glad I caught myself from the beginning so I didn’t have to back track and guess. I am sure you all wouldn’t appreciate a recipe that was a “guess” more than an actual recipe. No body wants to cook an experiment when they are hoping for a good meal. In a large skillet over medium-high heat add the olive oil. season chicken with salt and pepper and add to the pan. Lightly brown the chicken bites on all sides, just until a pale yellow, about 3 minutes. Turn off heat and reserve cooked chicken. In a large soup pot, melt the butter over medium heat. Add the onions, carrots, celery, and poultry seasoning to the pot and stir well. Cover the pot and continue to cook the veggies over medium heat for 10 minutes, stirring occasionally. Remove lid and add the flour, stir to combine well and cook for about 1 minutes to cook away the raw flour taste. Add reserved chicken with the pan juices, white wine, and stock (If you do not use wine add 6 cups of chicken stock). Bring the soup to a boil and then reduce heat. Simmer soup for 30 minutes, until sauce has thickened and the vegetables are soft. Adjust seasoning if needed.